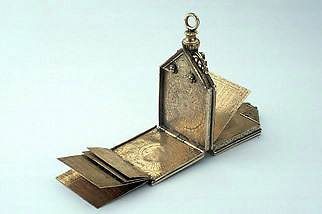 Crammed with tables, diagrams and miniature instruments, this compendium serves as a brass version of the printed almanacs published in large numbers in the 16th century. Several of its tables correspond with those in Leonard Digges's Prognostication of Right Good Effect (1555). Amongst its features are a nocturnal, a universal equinoctial sun and moon dial, a horizontal sundial and quadratum nauticum, as well as calendrical, astrological and tide tables. Fitted with a chain through its suspension ring, the instrument could have been worn around the neck as a piece of decorative but ingenious personal ornament (see also Epact 83304).